Disclaimer: This post is sponsored by Lowe’s Home Improvement. 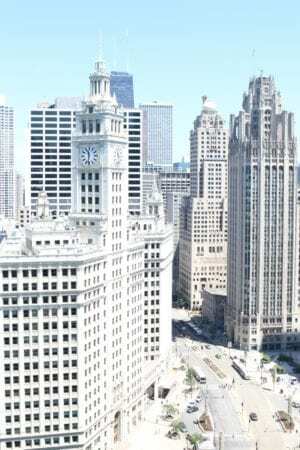 All opinions and photography are our own and are not influenced by Lowe’s Home Improvement. 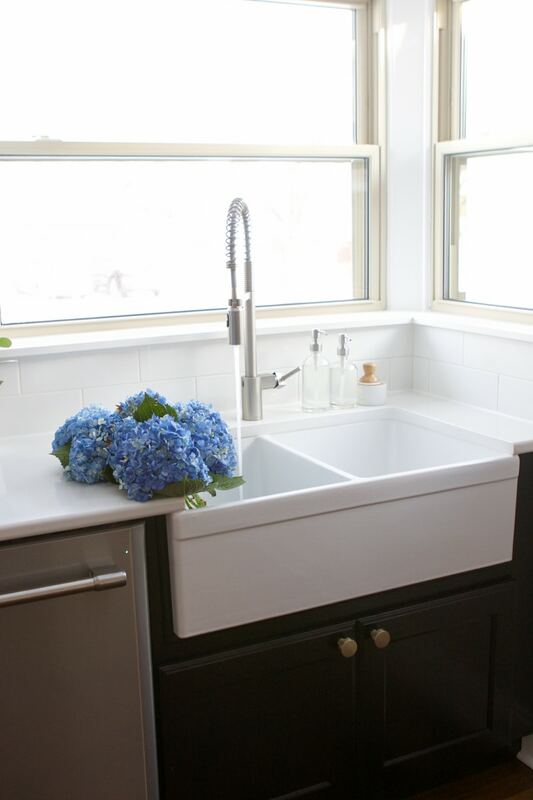 I’ve always dreamed of having a big, white farmhouse sink someday. But quite honestly, never thought this dream would ever be a reality since I often think of these gorgeous sinks in large, luxurious farmhouse kitchens and not so much in an average-sized kitchen. I never see myself living in a super big house so I figured having a luxurious farmhouse sink was just not in my cards, and I would just have to admire them from afar. 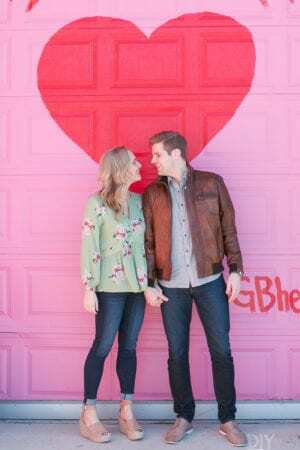 Fast forward to last year when I was starting to make plans for my kitchen renovation and it was time to choose all of the materials, appliances, and things we needed for the kitchen – including a new sink. 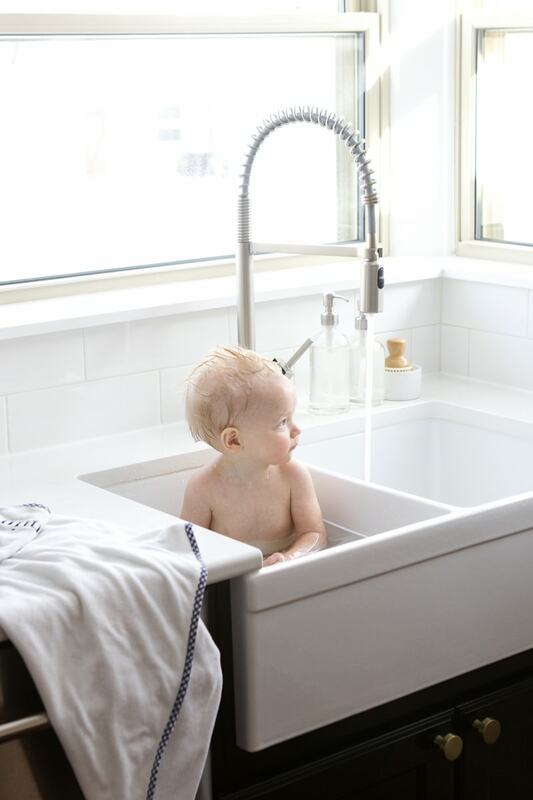 I had my expectations of somehow pulling off a gorgeous farmhouse sink in our new kitchen set very low, but was pleasantly surprised to find out that getting this dream sink WAS an option. And not just any option, it was a realistic one that totally made sense. 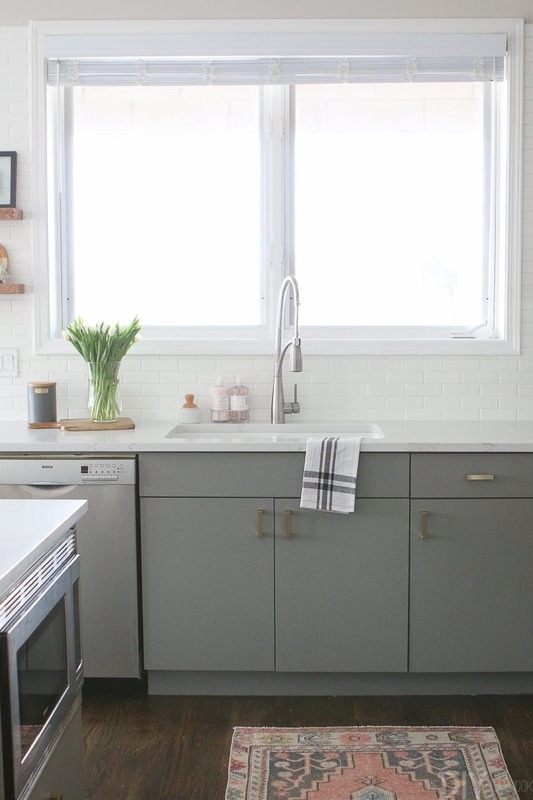 If you share my dreams of having your very own gorgeous farmhouse sink someday, I am here to tell you it’s totally possible! 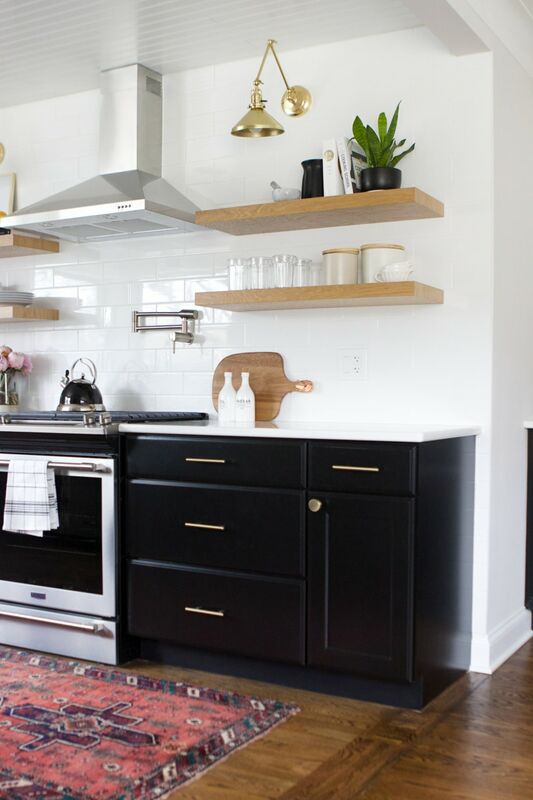 I’m also here to break down all of the things you need to consider and decide on before choosing and installing this gorgeous beauty in your kitchen. 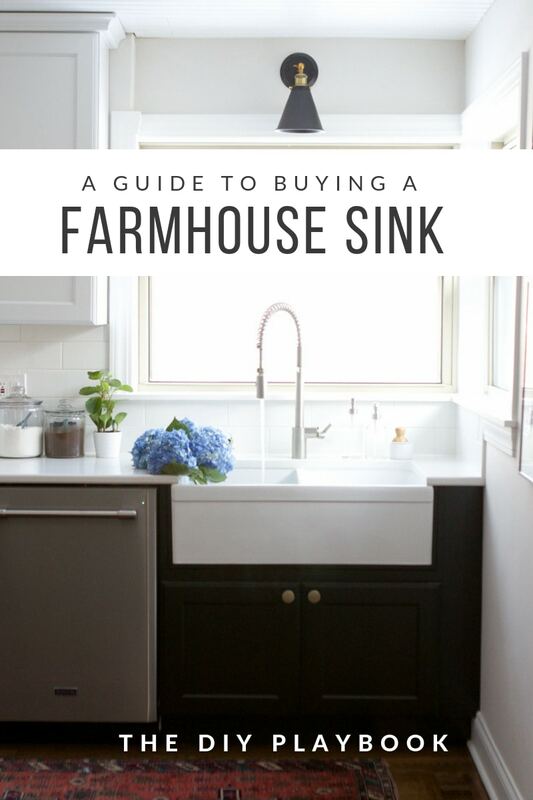 What size will your farmhouse kitchen sink be? Farmhouse sinks actually come in a variety of different widths depending on the size that you need. 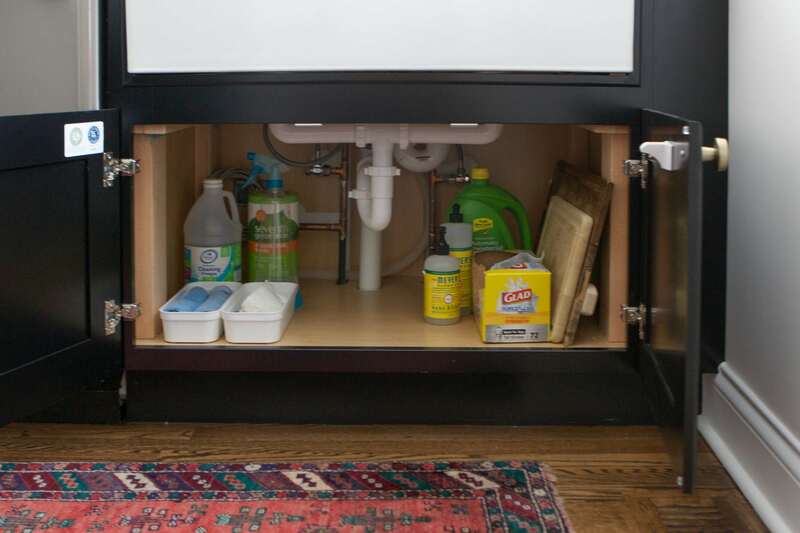 If you’re installing a farmhouse sink into your kitchen without any renovation, the cabinet size under your kitchen sink will dictate the size of your sink. We originally had plans to put a farmhouse sink in Casey’s mom’s kitchen but weren’t able to because of the cabinets. Because we just had the cabinets painted (instead of putting new ones in), the large sink wasn’t going to work with her existing cabinets. 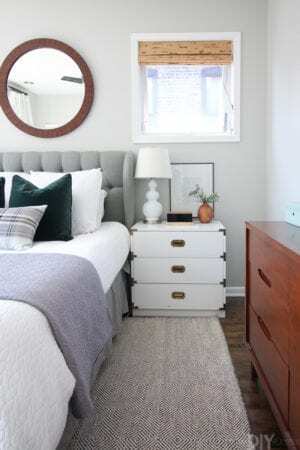 So definitely something to consider if you’re not doing a full reno. If you’re renovating your kitchen and ordering new cabinets (like we did), you have more flexibility on sizing. Either way, the width of the farmhouse sink should be a few inches smaller than the cabinet that it will sit on top of. 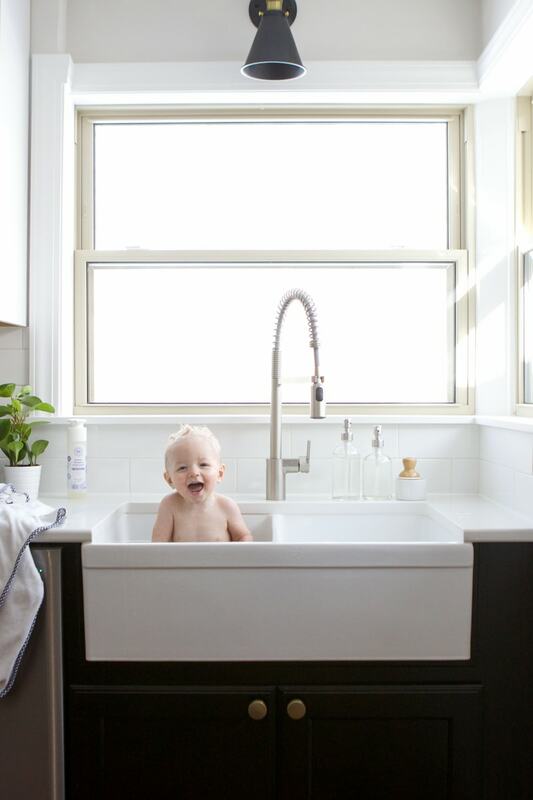 The next decision you’ll have to make is whether you want your farmhouse sink to be one basin or two. This really all depends on personal preference. We ultimately decided on this two-basin sink. I didn’t have a strong preference either way, but we ultimately went with the two-basin for the few occasions we do dishes by hand. I liked the option of having one basin to fill with soapy water and one to rinse our dishes. That was just me and not even a huge priority for us. Honestly, I think it’s a win-win because both are amazing! A traditional farmhouse sink has an exposed “front apron”, or the part of the sink that you see when looking at it straight on. The front apron makes for a gorgeous focal point in your kitchen. 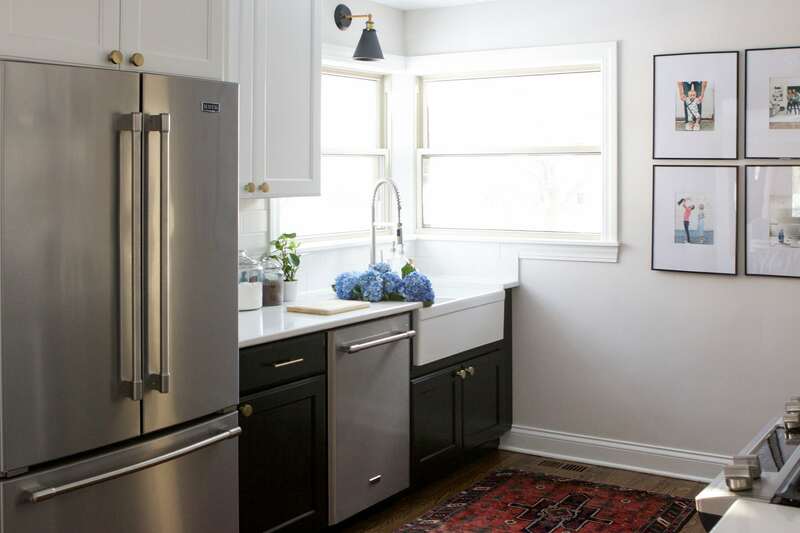 But if you’re working with existing cabinets and countertops an exposed front apron may not be an option (like in Jan’s gorgeous kitchen makeover). Not that all existing kitchens will present this same problem, but it is something to consider when choosing a sink. If you’re changing the cabinets during your renovation, then the exposed front apron will be an option. Again, this is all personal preference but a decision you will have to make in the process. For those who choose an exposed front apron, be aware that you have options when it comes to the design on the front apron. 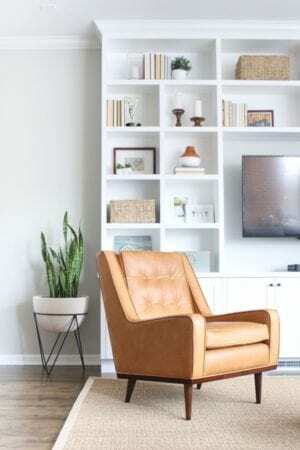 Do you want a classic, streamline front like mine or would you prefer a subtle design for a larger statement? Lowe’s offers curated collections from the brands that matter most and they have so many gorgeous farmhouse sinks to choose from. It’s kinda hard to choose just one! 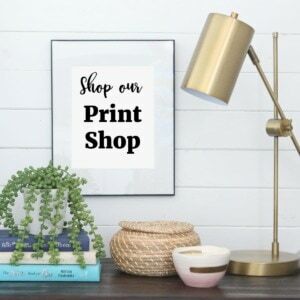 Lowe’s does offer free shipping and easy returns, so you can always return if you find that the design doesn’t work with the final look of your kitchen space. Next up, what finish do you want your farmhouse sink to be? 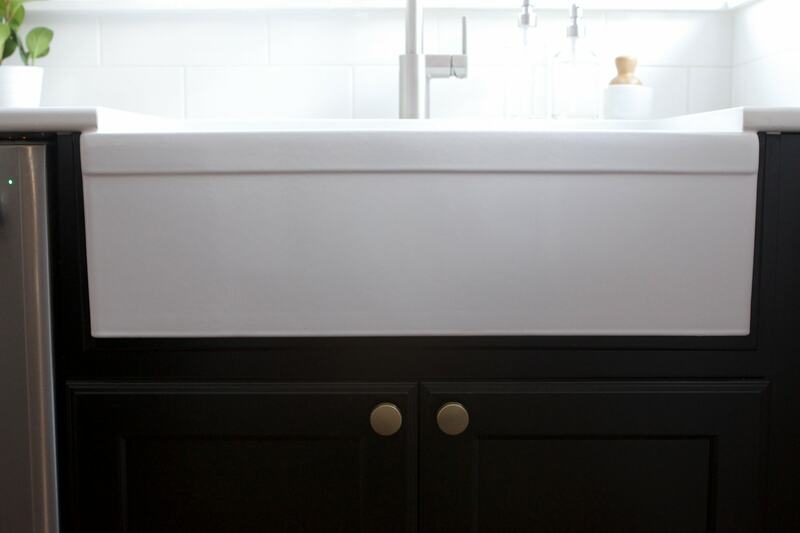 A traditional white farmhouse sink is typically made from fireclay, but these sinks can be made materials like stainless steel, matte stone, and everything in between! The material you choose will not only impact the aesthetic of the kitchen but it will also dictate how you maintain the sink. Be sure to consider the pros and cons of each material before deciding what is best for your kitchen. 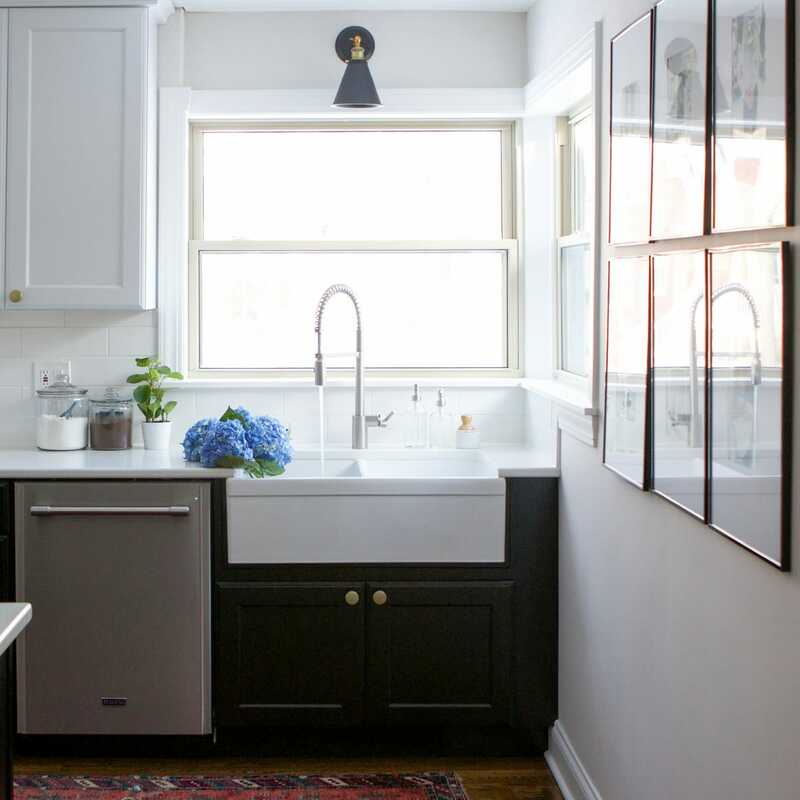 This decision is directed more toward those who are getting new cabinets along with the farmhouse sink. 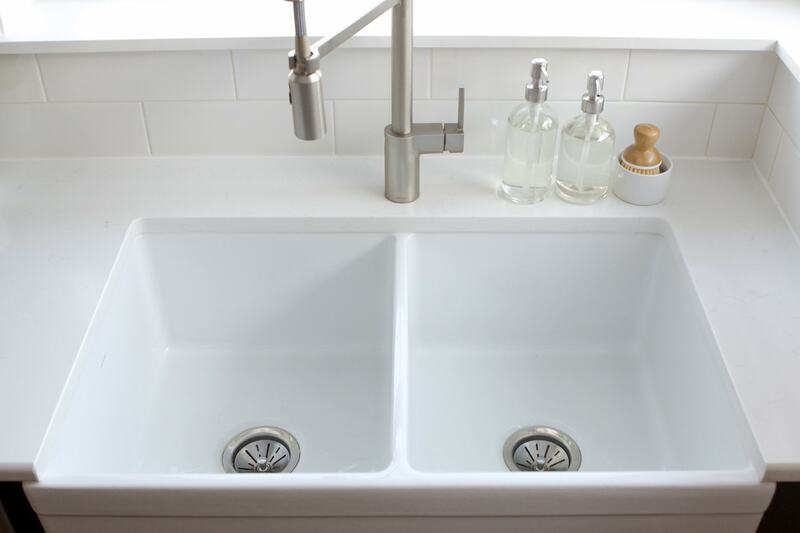 The size of the farmhouse sink will obviously dictate the cabinet you will need to order for under the sink. But before ordering your cabinet, be sure to communicate to the cabinet specialist that you plan on having a farmhouse sink installed. This detail will impact the size of the doors on the cabinets, especially if you have an exposed front apron. Communicating this in advance will ensure the cabinet and the sink will work well together. 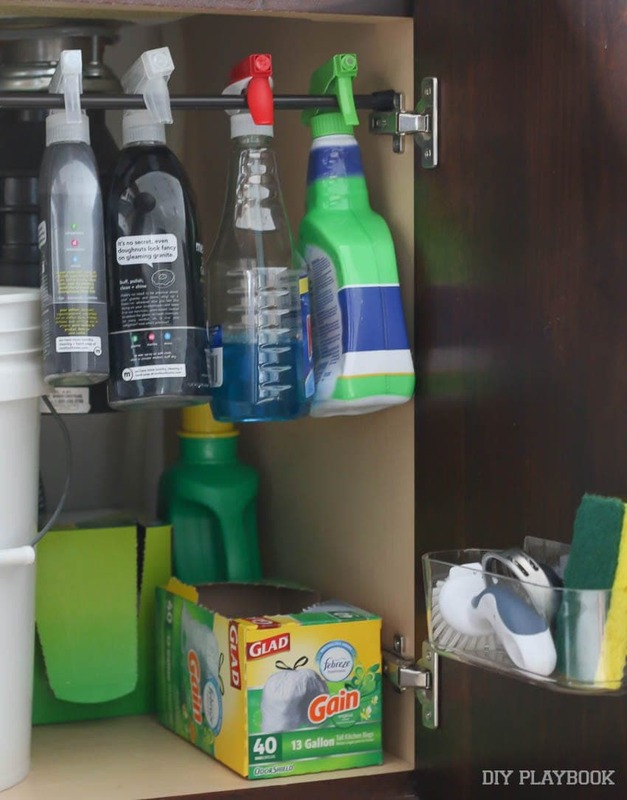 Another thing worth noting when it comes to the cabinets under a farmhouse sink is that it will impede on the amount of storage space you have in the cabinet below the sink. Farmhouse sinks are DEEP, which means that depth will eat into the cabinet storage. Not the end of the world, but something to consider when planning for your new kitchen! 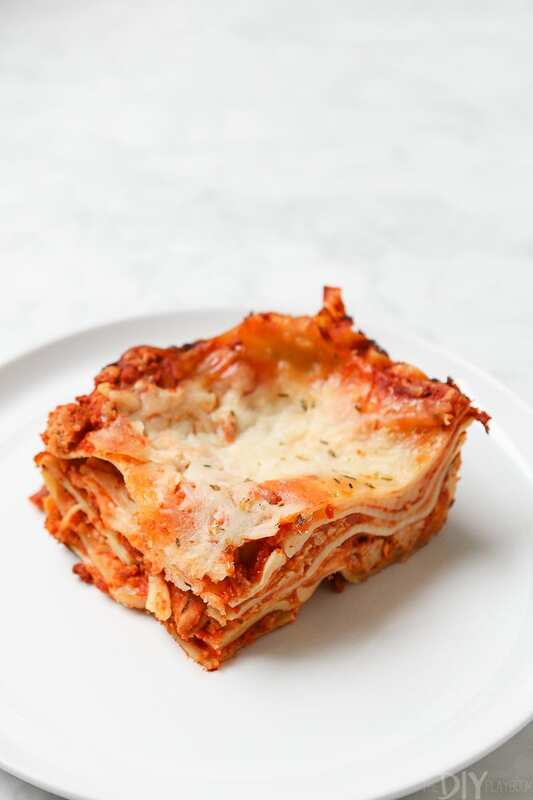 This one I actually learned the hard way through my kitchen renovation, so hopefully, my mistake will save you from making it too! I didn’t communicate to my plumbers that we were converting to a farmhouse sink after renovation and therefore, they didn’t know to change the plumbing location in the wall. To make a long story short, the farmhouse sink is a lot bigger (and deeper) than our old sink and therefore, the plumbing needed to be moved in order to accommodate these changes. I never knew this so I never even knew to tell my plumber this important information! Fast forward until after our cabinets and sink were installed, when we found out that the plumbing needed to be moved. The whole problem could have been eliminated if I just spoke up before the walls were closed up and the cabinet installation started. Note to others: make the plumbers/contractors aware of your farmhouse sink plans as soon as you can! Last, but not least, let’s chat about choosing the perfect faucet to pair with your new farmhouse sink! If you’re getting new countertops, you will have more freedom when it comes to choosing a faucet because the countertop team will cut holes into the countertop to accommodate your new faucet. 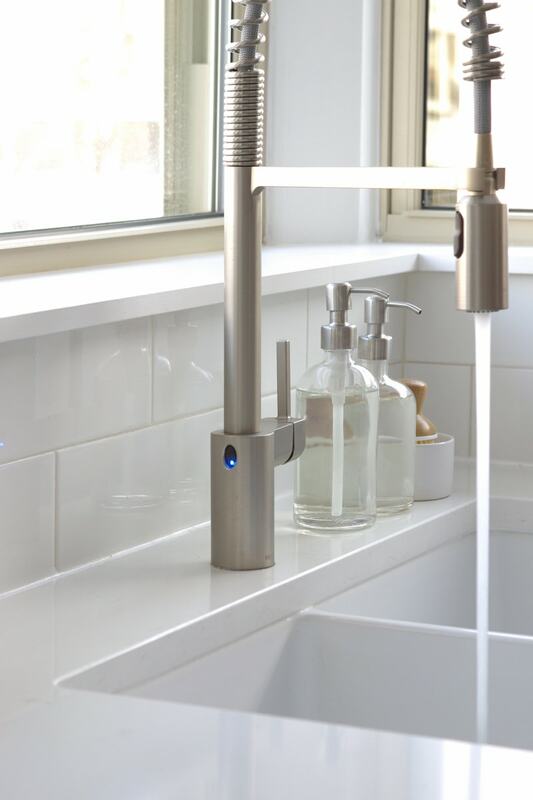 For me, I chose this Moen faucet (in spot resistant stainless! ), which only required a single hole cut into the countertops. I made sure to have the faucet on hand before the countertops were installed so they knew how many holes to cut. 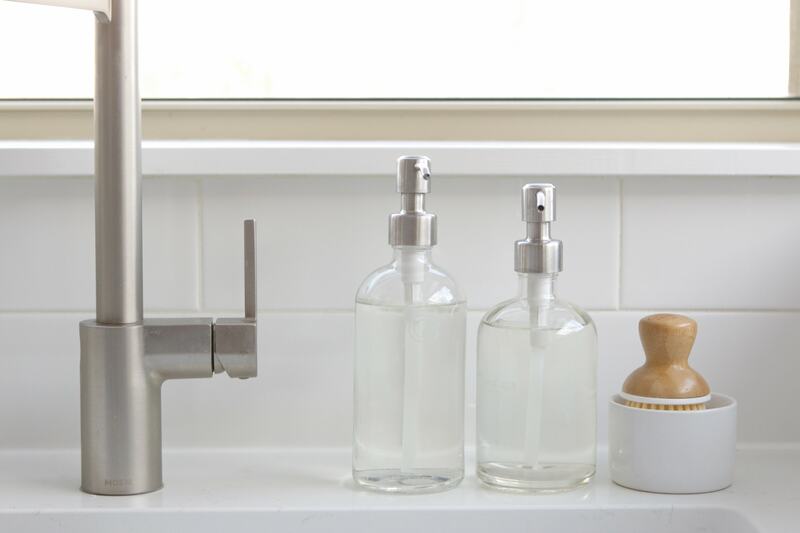 If you are installing your farmhouse sink into an existing countertop, you will have to choose a faucet that aligns with the number of holes you already have within your countertop or at least make sure your faucet comes with a cover plate to hide the unused holes. I’d also highly recommend choosing a pull-down faucet because of the size of a farmhouse sink. 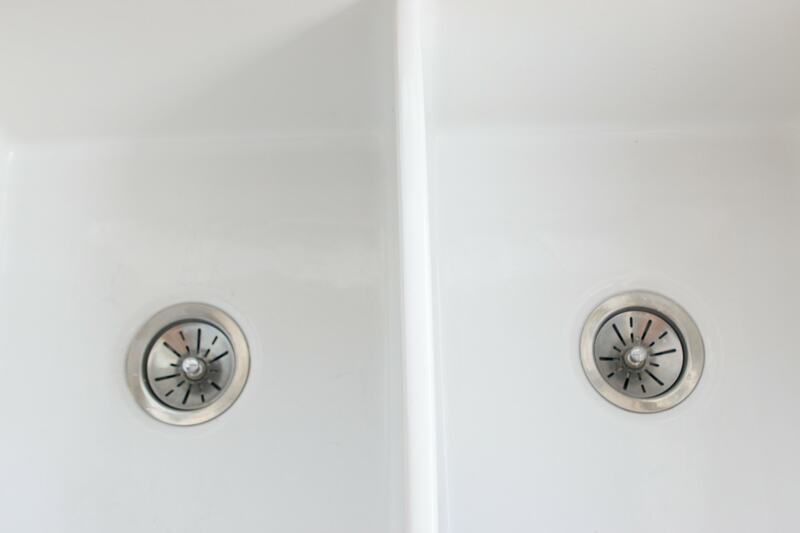 Having the option to pull the faucet out and clean around the deep basins is extremely useful on an everyday basis. 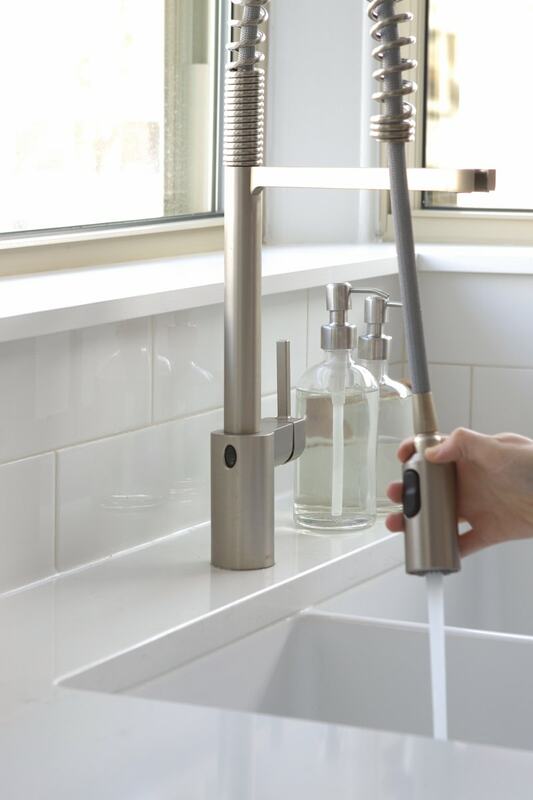 Here are some of the pull-down faucets I love. The ones with the asterisk have touch or sensor technology, a characteristic both Casey and I love having on our kitchen faucets. The best part of these faucets is that they would look gorgeous with or without a farmhouse sink. 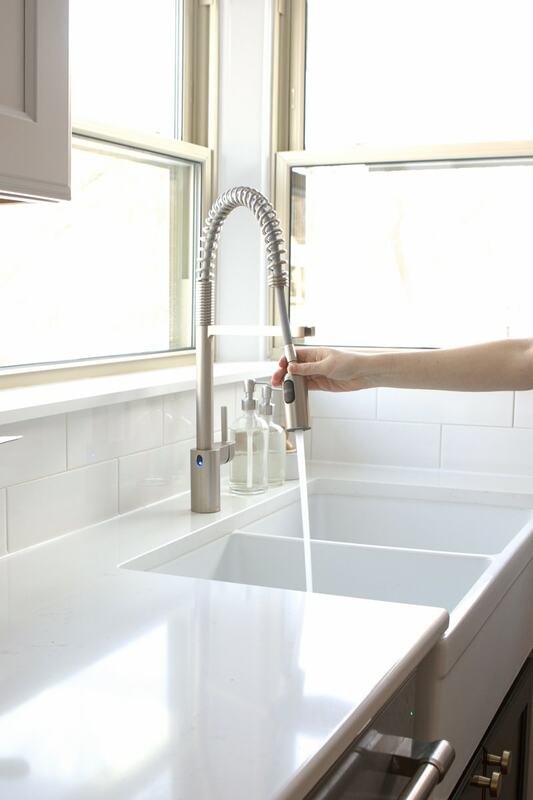 Plus, changing out a faucet is such an easy DIY project that you can do in less than an hour! Here’s a simple tutorial we’ve shared in the past that gives you the step-by-step. 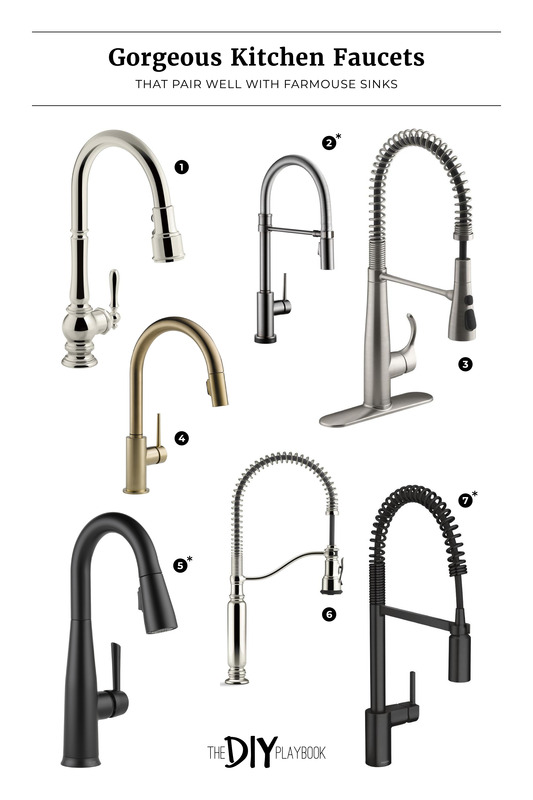 If you’re thinking of upgrading your kitchen faucet in general… all of these gorgeous options would instantly refresh your kitchen (and you can get one quick with free shipping from Lowe’s!). 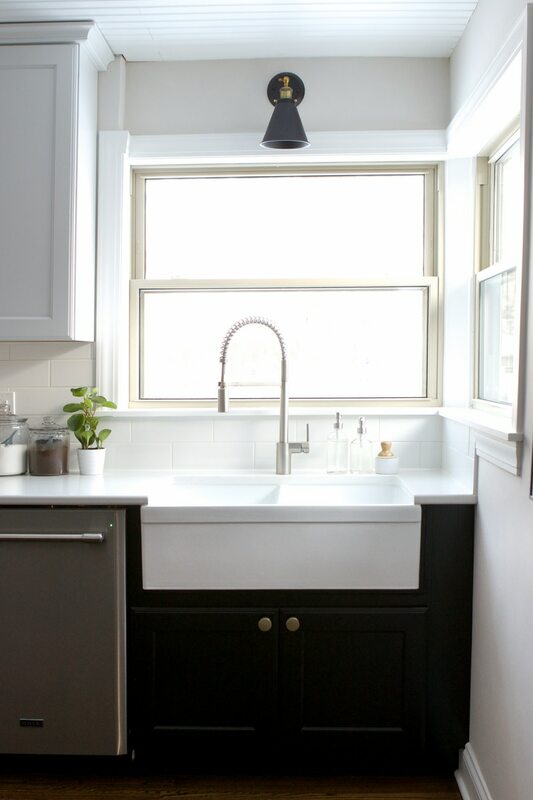 I’ve been living with my farmhouse sink for a few months now and I just can’t get enough because it’s so good! I love every single thing about it and am so glad I incorporated this dreamy piece into our new kitchen. 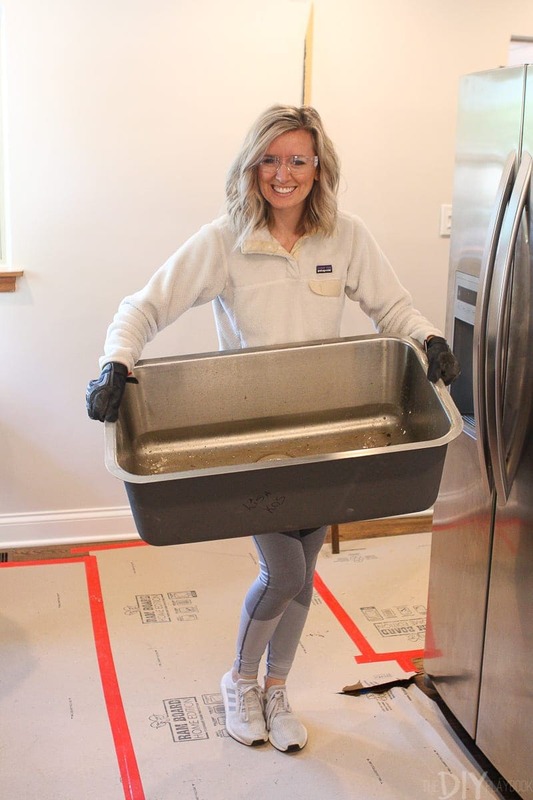 If you are making plans for a kitchen renovation or just have dreams of your very own farmhouse sink, I am here to tell you that it CAN happen! 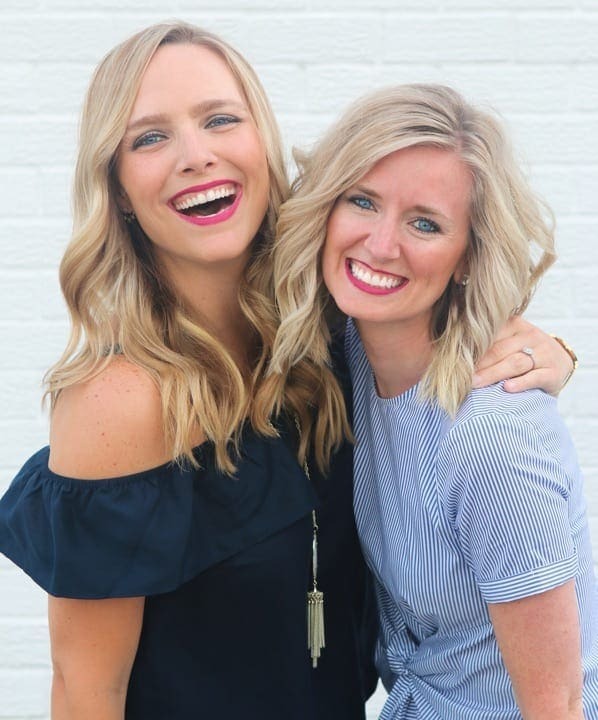 With this list of things to consider, you will be armed with the information you need to finally make those dreams a reality! Any other farmhouse sink lovers tuning in?! 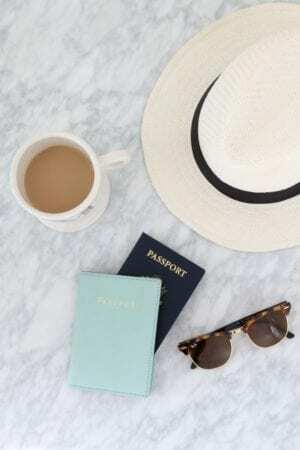 I’d love to hear about your experience and I’m sure the fellow dreamers would appreciate your insight as well.